We all know that Hyderabad is famous for pearls, glass bangles and Hyderabadi biryani. Today, let us visit Laad Bazaar for learning much more about the colourful and fashionable glass bangles Hyderabad is so famous for. 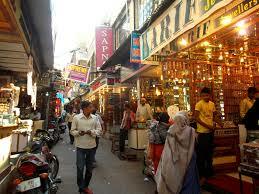 About 100 glass bangle shops are present in and around Charminar. There are wholesale exporters, manufacturers as well as suppliers. The bustling Laad bazaar is also known as 'Street of bangles' or 'Bridal Bazaar of Hyderabad'. If you plan to visit Charminar, High Court or Salarjung Museum, you can just take out some time and visit the by lanes of this famous and much crowded market too. It is named 'Laad Bazaar' after Ladli Begum, wife of Hyderabad VI Nizam, Mir Mehboob khan. 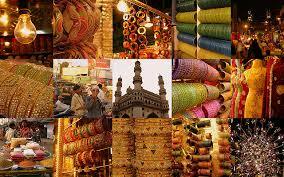 Laad bazaar is located in the vicinity of the Charminar area. Here, you will come across a multitude of shops that sell such bangles. People visit this market compulsorily during festivals or when they are preparing for wedding in their family. You can find a variety of these bangles in the market. FromHyderabadi lacquered or laad bangles which are made up of lac and then studded with pieces of glass, other types of glass bangles are also available which include bracelets, ethnic bangles, bangles for wedding etc. Apart from the Charminar market area, glass bangles can also be bought from Laad bazaar. Apart from glass bangles, bangles made of bamboo, gold, silver, plastic, metal and wood are also available in these markets. This market has attracted tourists and locals for past several years. Around 500-600 tourists visit this market everyday. In India, glass bangles are also manufactured in Firozabad in India and Hyderabad in Pakistan. Laad bazar or Bangle bazaar or Churi bazaar is a market where you can test your bargaining skills! In Laad Bazaar, lac bangles are also available. Lac bangles are embedded with colourful stones and mirror pieces. There are silver bangles and brass bangles to add to your shopping list! The shops have a stack of bangles - all of varied designs to entice you into buying. During Ramadan, you can buy really traditional bangles at comparatively low price. The crowd will be much more than you will witness throughout the year. But then what is celebration without people! You will have to walk your way through the lanes of the market. 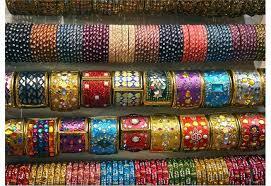 Check out for bangles in shops near Charminar for exquisite bangles. Do you know that this bazaar remains open all through the night during Ramadan? That is why it is also known as 'Night Bazaar of Hyderabad'. At that time you can buy not only bangles but foorwear, dress materials, sherwanis, perfumes, crockery etc. also from Laad bazaar. You can get sherwanis and pagris on rent too. What's more! the bazaar is also open during Sundays during Ramadan. Shopkeepers can speak Urdu, Hindi and Telugu. around 15,000 people are employed in this market.If you are good in haggling, you can buy bangles at half the price quoted by the shopkeeper! There are retail as well as wholesale shops in Laad bazaar. You can board on APSRTC bus from various locations in Hyderabad. There are bus stations near Laad bazaar namely Charminar Bus Station and Mahatma Gandhi Bus Station (MGBS). You can also hire auto rickshaws and reach Laad bazaar. Do men visit these markets? A pertinent question indeed! Well, yes, for buying bangles as gifts for their wives. Just visiting the market is so enthralling --- You will enjoy the sight of colourful bangles, happy buyers, the sound of bangles in the background and the little mirrors from the bangles twinkling and telling you how little things of life can make everyone so happy!